Welcome to Amber's Home Page! Amber might just have been the first dog on the web to have her own home page, originally created way back on November 4, 1994. There are now countless others. Use your favorite web search engine to find them, or check out Amber's favorite links below. 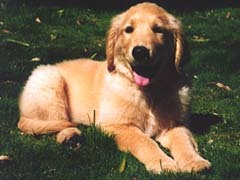 The Golden Retriever Home Page includes Golden pictures as well as links to other Golden web pages. I got Amber from Debi DeNardi at Sherwood Goldens. If you're looking for a Golden puppy of your own, you should get in touch with Debi ( here's why). If she doesn't have any puppies on the way, she'll probably be able to refer you to someone who does. Debi is also a fantastic photographer, as you can see if you check out the many excellent pictures of goldens (most of which she has bred) on her page. Another way to obtain a Golden is through one of the many Golden Rescue organizations. In Northern California, you should get in touch with NorCal Golden Retriever Rescue. Last update: 11/18/00 - Added links to Sherwood Goldens and NorCal Golden Rescue. Previous update: 12/27/99 - Moved these pages to their new home at lemkeville.org. Previous update: 12/20/98 - Moved these pages to their new home at shockwave.org. Previous update: 7/21/96 - Moved these pages to their new home at shockwave.com.